You are currently browsing the The Movie Mark blog archives for May, 2012. E.T. is one of the few movies my parents took me to see at the theater. The Empire Strikes Back was the first. I cried when E.T. was dying. When E.T. is turning white he always reminded me of a popsicle that had all the juice sucked out of it until it was just white ice. My cousin started calling me Elliot because I bore a striking resemblance to Elliot. I was only a few years younger than he and even had the same red hoodie that he wore throughout the movie. Most impressive was the John Fogerty mop-top I was sportin’. I had a slight crush on Elliot’s mom (Dee Wallace). Don’t ask me. I can tell you one thing for sure – that haircut doesn’t stand the test of time! For those of you who are still huge E.T. fans, I have great news for you – it’s finally being released on Blu-ray, complete with 7.1 Surround sound and hours of bonus features. Now one thing I can say that really annoyed me was when Steven Spielberg re-released the film a few years back and removed the shotguns from the policemen and replaced them with walkie talkies. I hate when directors pull these shenanigans. Do you hear me, George Lucas?? I don’t care what your fancy editing says, HAN SOLO SHOT FIRST! 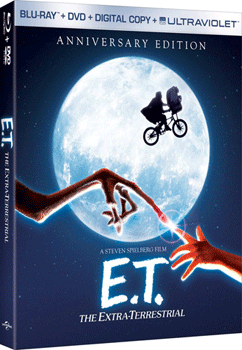 Anyway, I’m happy to report that this does indeed to appear to be the original theatrical version of E.T. Watch the trailer below and you’ll see that the officers are holding shotguns and not digitally added walkie talkies (which is an incredibly stupid name, if you think about it). So what do you think, should I check out this Blu-ray release? Does E.T. stand the test of time? Or is this a childhood memory that should be left intact? For more info on the Blu-ray and all the special features it contains, check out this official press release. The Blu-ray will be released in October 2012. 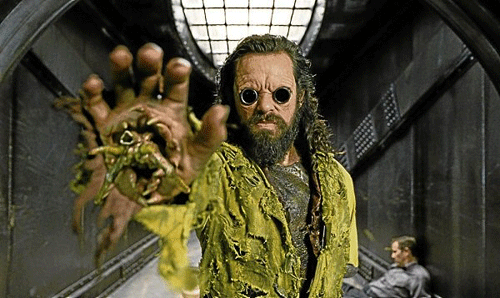 We’ve been looking at the heroes of Men in Black 3 lately, particularly the inimitable Josh Brolin, but what about the villains? Jermaine Clement, of Flight of the Concords fame, portrays the main bad guy, Boris the Animal. While Brolin is portraying a young Tommy Lee Jones, it looks like Clement is channeling his inner Randy ‘Macho Man’ Savage. Check out the exclusive clip below for some inside info on the character. 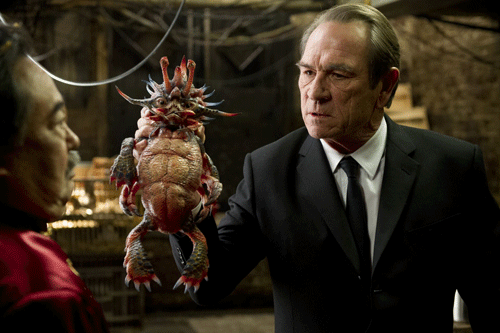 Men in Black 3 Clip: You Have These in the Future? In today’s exclusive Men in Black 3 clip, Josh Brolin and Will Smith take a ride on what looks to be some futuristic motorcycles. Although we know they’re not futuristic because this takes place in the 60s. However, they’re more futuristic than anything we’ve got today. I’m sure it’s stuff the government is hiding from us. In Roswell, no doubt. I’m fairly devastated that I won’t be able to attend the MIB3 screening tonight, but I have a previous engagement to save the world via softball. However, my lovely wife and one of her friends will be attending, and I will report their feedback. Granted, I should probably question why my wife has chosen watching MIB3 over watching me dominate on the softball field, but alas, it’s hard to deny someone the opportunity to see Josh Brolin display his talents on the big screen a full three days before the rest of the world. Rest assured, my plan is to see it sometime this weekend and have a review for you next week. For now, enjoy the clip and please tell all your friends to pay The Movie Mark a visit. “More Brolin” is the new “more cowbell.” It’s a revolutionary movement that I’m starting, people. Get on board or get left at the station. It’s your choice. When someone asks, “You know what this Monday needs?” you can simply respond, “More Brolin.” And that, my dear readers, is what I’m giving you today. In today’s exclusive Men in Black 3 featurette, Josh Brolin, Tommy Lee Jones, and Barry Sonnenfeld discuss the seamless transition from TLJ’s Agent K to Brolin’s younger incarnation of him. Regarding his opinion of ol’ J Bro and his portrayal of the iconic character, Jones simply says, “He’s enormously talented and funny.” Men in Black 3 opens this Friday, May 25th. 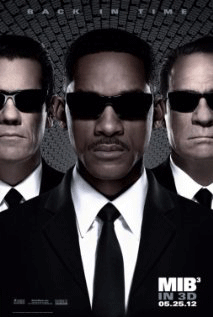 Movie Clip: Men in Black 3 – Who are you and what do you know? This review didn’t sit well with some mothers who thought it was harmless fun, but I stood my ground. “It’s just a movie” doesn’t work with me. I will not forsake the welfare of our children and let them think that cheaters win. 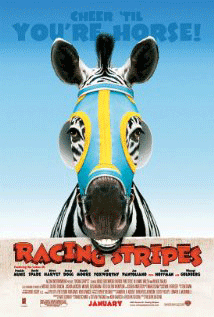 Go on and read my Racing Stripes movie review to see what helped brand solidify my reputation as a truth-sayer back in 2005.